"We're in the business of making dreams come true." Not the words of a Hollywood director or even a toy company boss, but what Bart Day was told during his interview for his role as head of marketing for Bailey of Bristol, which is one of Europe's biggest caravan manufacturers. The company is the UK's oldest leisure vehicle maker and has been family-run since its inception almost 70 years ago. Bailey sells some 7,000 caravans a year, generating annual revenues of about £100m and it plans to boost production to 10,000 a year in the near future. This ambitious target reflects a healthy UK demand for touring caravans. Just over 22,000 were sold in the year to June - a 7% rise on the previous 12 months - while sales for the entire leisure vehicle market, which also includes motor homes and static caravans, rose by 9% to more than 56,000. 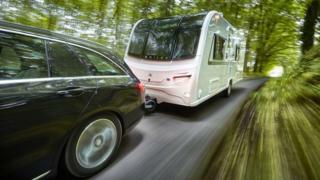 Brits remain Europe's biggest buyers of touring caravans and the UK market is second only to the US. John Lally, head of the industry body, the NCC, attributes this rise in sales to a change in holiday behaviour. 'Staycationing' is retaining and even increasing its appeal, he says, and we are going on more frequent, shorter holidays. "Tourers, motor-homes and caravan holiday homes are perfect for this." But why do the British love caravans so much? For Bart Day it is partly the "British belief that we're all explorers; being able to do what you want, when you want", as well as a fondness for owning our "castle", even if it is on wheels. Bailey caravans cost between £15,000 and £27,000. Despite the hefty price tags some consumers are opting to buy one, rather than spend money on a foreign holiday, says Mr Day. The slide in the value of the pound since the EU referendum has made that decision easier for many, he adds: "Regardless of Brexit… people still want to go on holiday, 'staycations' are becoming more popular." Is the ski industry on a slippery slope? What price would you put on a passport? Would you risk jail for a cup of tea? While some buyers were taken on caravan holidays as children, the challenge for the industry is winning over "those who have been brought up with Jeremy Clarkson blowing caravans up", says Mr Day - a reference to the TV antics of the former Top Gear presenter. Almost every new caravan is now well insulated, with built-in heating and a toilet, but many still associate sleeping in one to waking up to condensed breath and frost on the inside of the windows. That was the case for Dan Trudgian, who remembers being "very cold all the time" in a van on seaside holidays with his parents in the 1980s. Yet a desire to go on holiday more frequently, prompted him and his wife Angela to buy a van a few years ago. Their first night banished those unhappy childhood memories for good: "All we needed was a duvet", he recalls, annoyed that he had wasted money on sleeping bags. Despite initially focussing on a caravan as a means of cheaper holidays, he says it is the freedom to move on that has proved to be the main attraction. "You can park it wherever you want and wherever you wake up it's somewhere completely different. And if you don't like it you can move on. It's all about the adventure." Finding there was a dearth of online resources for caravan novices like himself led him to start a YouTube channel. Some videos, such as how to level or clean a van, have had tens of thousands of views: "These are all things that people need to know, but no one has a clue how to do them." Hull-based Swift, the UK's biggest caravan maker with 40% of the domestic market and annual revenues of about £200m, is also on a mission to introduce them to a new generation. People who like going mountain biking, fishing or to watch motor sports are one group its targeting, says commercial director Nick Page. "They might be staying in a caravan, but they're not caravaners as such. We're promoting a lifestyle, rather than the product itself." As caravans now routinely come equipped with all the creature comforts of home, manufacturers have been forced to make them lighter, to enable modern cars to tow them. Swift has eliminated timber from caravan frames, for example. "They're more aerodynamic and stable on the road, while active trailer control systems, which is similar to ABS, makes them far easier to tow and more fuel efficient as well," explains Mr Page. Like its Bristol-based rival, Swift says that the arrival of personal contract purchases - a form of leasing - in the UK caravan market has made them affordable, as only a deposit is needed. This has also created a healthy second-hand market. As well as buoyant sales in the UK, Swift is exporting its caravan; not only in Europe, to countries such as Germany, Sweden and the Netherlands, but much further afield in Australia, China and South Korea, as well. And for British caravan enthusiasts for whom nothing but the best will do, Swift recently began importing Airstream caravans - or "silver shiny bullets" says Nick Page - from the US. Each one takes about a month to be hand-built, reflected in a price tag that starts at about £70,000. It is a long way from the £200 that Martin Bailey charged for his first caravan, made in a shed in Bristol back in 1948.